It took me a little time to write this. Somehow... I didn't want to say anything about this, but I know I have a lot of people to thank for #OpsBunga. What started as a small idea by me out of frustration over the politicking in Sabah, amidst the death and fear... became something that was talked about not only in Malaysia, but in other parts of the world. The idea was simple. To lay flowers, and to say a prayer. The reasons behind #OpsBunga were clear (click #OpsBunga anywhere and read if you haven't). And yet, Twitterjaya - the Malaysian Twitter community, as well as the Malaysian blogesphere and online community went full force to promote the event. I'm touched that so many total strangers, bonded over the simple call for peace. What surprised me even more was the attention the media gave to us. Thank you everyone... and all I can say is - at least we proved that social media CAN make a change. I got some hate from a few parties for doing this - from people saying it was a stupid idea to being called a hippie. Well, I guess I'd rather be a hippie any day than a keyboard warrior. 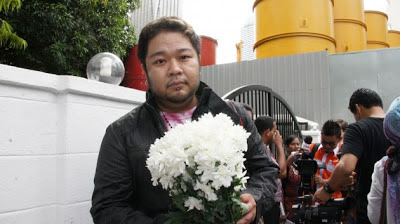 I don't want to say much more apart - since the attention shouldn't be on me, but a big hearty THANK YOU to Malaysians on Facebook, blogs, Twitter (especially Twitterjaya) for the support for #OpsBunga - we proved we can do something, and that we do have a voice. May this voice, however small, echo through this troubled times and bring forth a new belief, that peace can exist. Imagine all the people... living in harmony.